The Legacy Concert Series pays tribute to leading band directors who have shaped the band scene in Singapore over the past forty years. This concert features Professor Ho Hwee Long, Dr. Lee Tian Tee and Mr. Takehiro Oura, three maestros who have changed the landscape of the band world significantly. Over the decades, they have taken the musicality of the band world to the next level, surfacing the beautiful colours of the wind band and bringing to life the notes on the scores. Their legacy lives on through the musicians and the many band directors groomed under their wings. Come join us for an evening of the finest wind band music with the maestros, brought to you by the Windstars Ensemble. The Windstars Ensemble is a collective of Singapore’s finest musicians. Since its inception in 2012, it has garnered rapturous applause for its lyricism and beauty on the symphonic stage, as well as gritty, pumping pop rhythms. Besides all-time favourite band works such as St Anthony Variations, Miss Saigon, the Windstars Ensemble will also perform popular numbers such as, Giacomo Puccini’s Turandot, Evita and 76 Trombones. Dr. Lee Tian Tee graduated from Eastern Michigan University in 1986 with a Bachelor of Music (Trumpet Performance) degree under a four-year Public Service Commission– Singapore Symphony Orchestra scholarship. Under the tutelage of Mr. Carter Eggers and Mr. James Underwood, he mastered the rudiments of trumpet playing. He then took an interest in conducting and studied the fine art of conducting under renowned mentors including Professor Shalom Ronly Riklis, Mr. Russel Reed and the late Ms Elizabeth Green. When he returned, he served as a trumpeter in the Singapore Symphonic Orchestra for nine years and became the resident conductor of several bands including the Singapore Polytechnic Band, West-Winds, the National University of Singapore Symphonic Band and the Anglo-Chinese School (Independent) and Anglo-Chinese Junior College Concert Bands. In 1996, Dr. Lee left Singapore for further studies in the University of Pacific in California under the Lee Foundation scholarship. While he was there, he was also awarded the Graduate Assistant Scholarship of the Music Education Department. He also guest-conducted the University Orchestra and the concert Band and served as a trumpeter of the San Francisco Wind Orchestra. In the summer of 1997, he served as the senior faculty of the “Cazadero” Performing Arts Camp. Dr. Lee graduated as a Doctoral Graduate Research Scholar from the National Institute of Education/Nanyang Technological University in 2004, where he had focused his research on Singapore wind band education. Dr. Lee has led his bands to outstanding awards at numerous national and international band competitions, including Gold Awards in the biennial Singapore Youth Festival Band Competition in 2001, 2003, and the Gold with Honours awards in 2005 and 2007 (Top Three Bands for 2003, 2005, and 2007); First Prize award at the 14th World Music Contest in Netherlands, Bronze and Silver Award at the International Alpine Music Festival and clinching the Command Band title and Gold Awards at the Australian International Music Festival in 2001 and 2006. Being such a distinguished conductor has earned him a seat among the panel of adjudicators during the Singapore Youth Festival Central Judging of Concert Bands (Secondary Schools) in 1999 and (Primary Schools) in 2000, 2002 and the 10th Australian International Music Festival in Sydney. He served as the Music Director in the 25th and 26th National Cadet Officer Camp for Secondary School Bands. He was also invited to be the Conductor of the World Wind Band at the 11th Australian International Music Festival this year in Sydney and the guest conductor for the 2007 Hong Kong & Macau Band Fair. 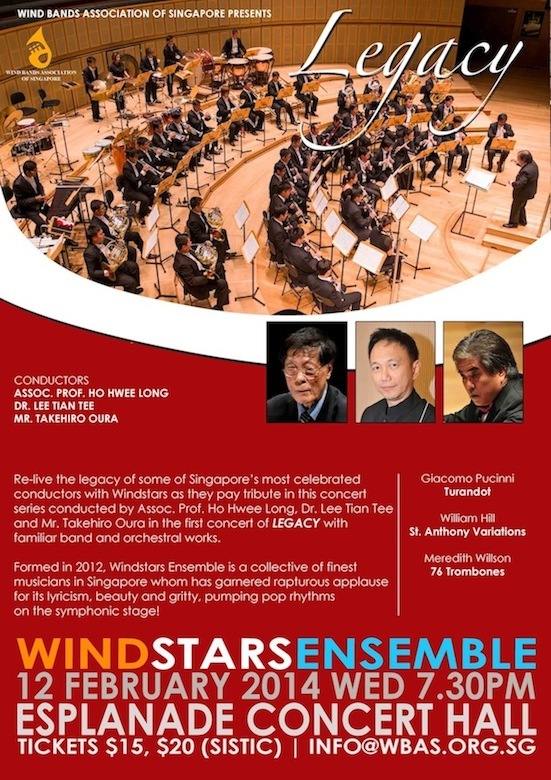 In 2001, Dr. Lee founded the Singapore chapter of the World Association of Symphonic Bands and Ensembles (WASBE, now known as the Wind Bands Association of Singapore) which organized numerous activities to promote and educate the local wind bands. In July 2005, he and his team successfully organized the prestigious 12th WASBE International Conference which drew many world-class wind bands and music educators from all over the world. The conference also included a music industry exhibition. Before leaving for China, Dr Lee was the conductor for Anglo-Chinese School (Independent) Symphonic Band and Wind Ensemble, Anglo-Chinese Junior College and Clementi Town Secondary School Concert Bands. At the same time he was also Music Director for West Winds, Band of the Bukit Batok Community Club (Singapore). Besides being president of the Wind Bands Association of Singapore, Dr. Lee also holds memberships to the Music Educators National Conference (MENC) and Conductors Guild. Presently Dr Lee is a visiting professor in the Music Education department of Sichuan Conservatory of Music, China and also a Yamaha (China) Artist. Associate Professor Ho Hwee Long is a widely recognized and respected figure in music circles. He possesses a Masters’ degree in Music Education from Northwestern University, Illinois, USA, and has studied band conducting under the tutelage of Professor John Paynter. Since 1967, he has an impressive record of achievements in the field of Singapore band music. He is currently an Associate Professor of the Division of Visual and Performing Arts in the National Institute of Education, Nanyang Technological University, where he coordinates the Specialist Diploma in Band Directing programme. His responsibilities within the academic group include conducting the symphonic band, research supervision and teaching music education, conducting and instrumental pedagogy. He is also a composer and arranger and has contributed a number of articles related to the symphonic band. He is also the conductor for National University of Singapore Wind Symphony and the National Junior College Symphonic Band. His love for music and beliefs in exacting standards has seen his bands make their mark in the local band scene. In January 2004, A/P Ho was conferred the Meritorious Award by the Composers and Authors Society of Singapore (COMPASS) for his outstanding and commendable achievements and contributions to the development of local music in Singapore and in 2007, he was conferred The Public Service Medal (Pingat Bakti Masyarakat – PBM) from the President of Singapore, His Excellency SR Nathan. In NIE, he was awarded the Excellence in Teaching Commendation in 2004 in recognition of teaching excellence achieved through the years. A well-known and respected conductor in the music circle in Singapore, Mr Oura conducted the Raffles Institute and Raffles Girls’ School Symphonic Band. Currently he conducts the Meridian Junior College, Riverside Secondary School, Peirce Secondary School as well as Nanyang Technological University Symphonic Band. Mr Oura graduated from the Tenri High School in Nara. He went on to the Sakuyo College of Music in Okayama where he studied percussion with Mr Imamura Mitsuaki and conducting techniques with Mr Watanabe Akeo, who was a former conductor of the Nippon Philharmonic Orchestra. After which he travelled to Paris to enroll in the Ecole Normale de Musique a Paris (French Conservatory of Music, Paris) in a further quest for musical knowledge and exposure. Mr Oura graduated with certificates in percussion and orchestra studies. During his 2 years there, Mr Oura was a member of the New National Symphonic Orchestra. On his return to Japan, Mr Oura became the instructor of the Tenri High School Symphonic Band and Marching Band, both highly respected top school bands in Japan. His foray into the Singapore music scene has benefitted the students who have come under his tutelage, and with his vast experience and enthusiasm for teaching, Mr Takehiro Oura can only further enrich the musical life of the Bands under his tutelage.